All Stakeholders interested in Corporate Governance, Corporate Transformation & Leadership. Company Secretaries (CS), Compliance Officers, Management & Financial Analysts & all concerned with ethical conduct of companies and good governance. Senior leaders and professionals, Directors (including Independent Directors), Presidents, CEOs, CFOs. Students pursuing professional and management courses, legislators, lawyers and jurists. India has moved to the forefront of governance challenges with Insolvency and Bankruptcy Code, 2016, SEBI (LODR) Regulations, 2015 and Companies Act, 2013. Annual Performance Evaluation of individual directors, the Board and its committees has been mandated and has the potential to significantly enhance Board effectiveness, maximize strengths, tackle weaknesses and improve corporate functioning. The Conclave aims to discuss corporate governance and insolvency arrangements as different parts of a continuum in the life of a corporate institution. 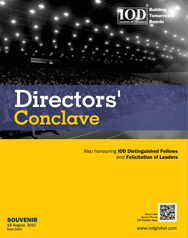 In a nutshell, the Conclave aims to discuss how boards can be more inclusive and ensure sustainability. Power packed insightful discussions, on the most topical board issues. Special focus on Board Effectiveness and Corporate Insolvency. Special presentation by Dubai Multi Commodities Centre (DMCC). Networking with top industry leaders & professionals from business, government & civil society. 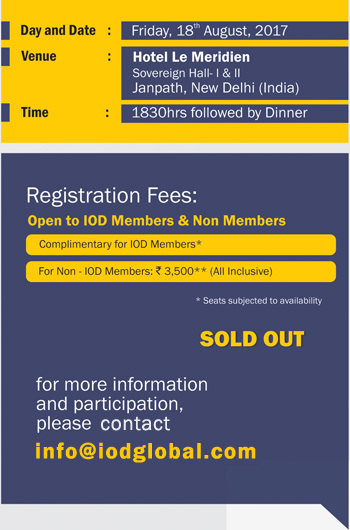 27th IOD Annual Meet & Network of IOD members. Dubai Multi Commodities Centre (DMCC) is a center of global trade. Headquartered in Dubai, It is the world's most interconnected Free Zone and the leading trade and enterprise hub for commodities. Weather developing vibrant neighborhoods with world-class property like Jumeirah lakes Towers, or delivering high performance business services. DMCC provides everything its dynamic community of over 92,000 people needs to live, work and thrive. DMCC has also created some of the most innovative market conditions and infrastructure for trade facilitation to take place - a Free Zone, commodity exchanges and online trading platforms, legal and regulatory frameworks. MSTC Limited, is a Mini Ratna Category-I PSU under the administrative control of the Ministry of Steel, Government of India. The company was set up in 9th September 1964 to act as a regulating authority for export of ferrous scrap with an investment of Rs 6 lakh. Government of India, Members ofSteel Arc Furnace Association and members of ISSAI had made with the investment. It became a subsidiary of SAIL in 1974. In 1982, it got delinked from SAIL and became an independent company under Ministry of Steel. It was a canalizing agency for import of ferrous scrap till 1992. MECON Limited, is a public sector under taking under the Ministry of Steel, Government of India. It is established in 1959 under the aegis of Central Engineering & Design Bureau (CEDB), is India’s frontline engineering, consultancy and contracting organization, offering full range of services required for setting up of Project from concept to commissioning including turnkey execution. It is a multi - disciplinary firm with 1465 experienced & dedicated engineers, scientists and technologists, having a network of offices spread all over the country, experienced in handling consultancy assignments and EPC Projects. MECON is an ISO: 9001:2008 company and is registered with international financial institutions like WB, ADB, AFDB and has technological tie-ups with world leaders. Jindal Stainless, is one of the largest stainless steel conglomerates in India and ranks amongst the top 10 stainless steel conglomerates in the world. It’s not only the magnitude of our operations that determines our credibility and name, but we remain inspired by our vision for innovation and enriching lives. Jindal Stainless Group has an annual crude steel capacity of 1.8 MTPA and the group has an annual turnover of Rs 14,500 crores. Our growth has been backed by the excellence of our people, value driven business operations, customer centricity, adoption of one of the best safety practices in the stainless steel industry and a commitment for social responsibility. National Co-operative Development Corporation (NCDC), is a development financing institution for the cooperative sector in the country and provides assistance for economic development of agriculture & rural sector through cooperative societies. The Corporation’s focus is on programmes of agricultural inputs, processing, storage and marketing of agriculture produce and supply of consumer goods in rural areas. In the non-farm sector, the Corporation’s endeavour is to equip cooperatives with facilities to promote income generating activities, with special focus on weaker sections such as handlooms, sericulture, poultry, fishery, scheduled caste & scheduled tribes cooperatives etc. It also provides assistance for capacity building and upgradation of skills of personnel involved in the cooperatives. National Agricultural Cooperative Marketing Federation of India Ltd. (NAFED), was established on the auspicious day of Gandhi Jayanti on 2nd October 1958. Nafed is registered under the Multi State Co-operative Societies Act. Nafed was setup with the object to promote Co-operative marketing of Agricultural Produce to benefit the farmers. Agricultural farmers are the main members of Nafed, who have the authority to say in the form of members of the General Body in the working of Nafed.